Or, snowberms, as Robyn would say. So we’ve been a little cooped up with all this snow that fell over the past week. And though it’s been cold for just a leisurely walk, I had to do it anyway. There’s only so much of the inside of my house I can take. 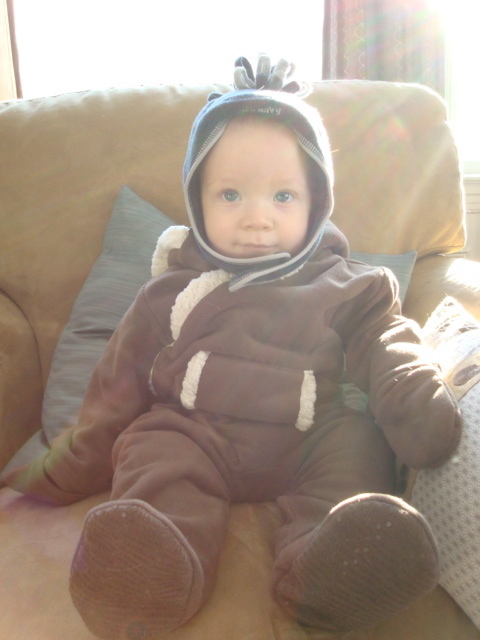 Time to bundle Dash up in his new snowsuit and head out for a jaunt up the street. Mom? I can’t move but for all the bundling. But Dash, I say, we’re going out into the freezing cold to walk up the street. We’ll step carefully on crunchy, packed down snow, our noses will drip everywhere, and we’ll probably slip on some ice on the way. It’ll be so much fun! I believe you mom. Let’s go! All of the above did indeed happen (note to self: bring tissues), but it was sunny and our spirits were lifted by the fresh air, so we (I) decided to do the complete block. It’s about a mile around, easy on a mild day, but we tend not to walk it in the winter. But I was feeling ok about it and Dash was enjoying himself, so we kept on walking. My disappointment in the city’s lack of plowing is perhaps best expressed by this picture, taken after the long, unexpected and cold, walk home. I was pretty annoyed, but then the city got a lot of bad press for dropping the ball during this particular storm (sidewalks not plowed around schools? Come on now.). 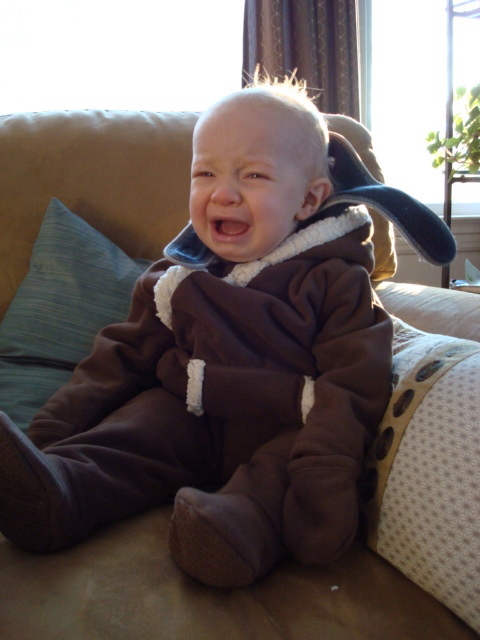 I still love you Portland, but why you gotta make my baby cry? 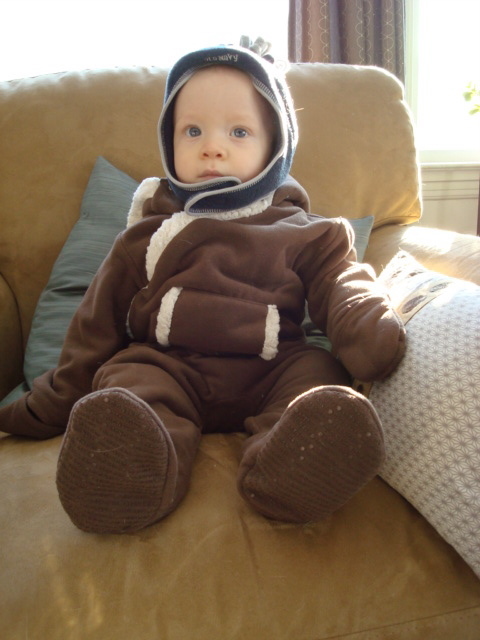 This entry was posted on Sunday, December 23rd, 2007 at 3:52 pm	and is filed under Dashiell. You can follow any responses to this entry through the RSS 2.0 feed. You can leave a response, or trackback from your own site. If I were you I would get one of those three-in-one frames and hang those pics as a series. But you’re probably not as mean as I am. fantastic idea. mean = hilarious. Thank you Miss Grace! Even through the tears, the cuteness comes through. p.s. I’d help you wrap your gifts if I could! Have a great Christmas. Awe! Dash is so cute. You and Neil are very lucky to have such a precious child. did I not tell you about the damn sidewalks? Damn sidewalks! What cute pictures. I love the outfit. In the first pic he looks a bit confused, wondering what’s about to happen. The second pic he looks ready and waiting. The third pic is discouraging his granny from even suggesting a walk this Friday! He certainly is a cutie! Hope he had a great first Christmas as well as the rest of the family.